It all starts when six kids have to meet for a weekly chat—by themselves, with no adults to listen in. There, in the room they soon dub the ARTT Room (short for "A Room to Talk"), they discover Jacqueline Woodson's first middle-grade novel since National Book Award winner Brown Girl Dreaming celebrates the healing that can occur when a group of students share their stories. To ask other readers questions about Harbor Me, please sign up. in middle of the story, we read: There are a bunch of kids who aren’t very nice here, Ashton said. The ones that call me Casper.... what does "Casper" refer to? If Hayley’s father supposedly has money, why couldn’t he hire a decent lawyer? It seems like vehicular manslaughter is a bit extreme when he was running for help. Plus—no phones to call 911? I don't often read books targeted for the middle school reader, but this is Woodson and I love how she tackles difficult subject. She does the same here, portraying six eleven and twelve year olds, all a different ethnicity, and from different backgrounds. All six have a harder time academically in school, for a few it is the language barrier, for another, not being able to be still. They are in an experimental classroom, and have an amazing teacher who sees a need, and fills it the best way. Sh I don't often read books targeted for the middle school reader, but this is Woodson and I love how she tackles difficult subject. She does the same here, portraying six eleven and twelve year olds, all a different ethnicity, and from different backgrounds. All six have a harder time academically in school, for a few it is the language barrier, for another, not being able to be still. They are in an experimental classroom, and have an amazing teacher who sees a need, and fills it the best way. She let's them leave her classroom, making available an empty art room, just so they can talk about whatever they want, without adult involvement. The kids call it ARTT, a room to talk. At first they find this awkward, but eventually we learn their stories, and what herartfelt stories they are. Woodson show how the many problems so many face, whether it is a parent in prison, the abrupt growing up of s black boy, or a young boy whose father has been taken by ICE, affect these young people. She does it in a way that is easy to relate too, and takes many of our nation's headlines, making them personal. If one can see and get to know someone different than you, ones views change, as these six kids experience this for themselves. I felt for all of them, quite impossible to not. A fantastic reading and learning experience for middle schoolers, a book that will open the lines of communication, or so I believe. I know just the young lady, a big reader, who will appreciate this book, and she will be receiving it for her tenth birthday. This book has EVERYTHING - love, family, friends, middle school transitions, and the devastating realities faced by so many of our children in this country. It brought me tears, goosebumps, and gratitude that I'm alive in a world with people like Jackie Woodson. Seriously - buy copies for your libraries and every family you know! For a middle grade novel that is less than 200 pages, this story manages to cram in quite a few serious subjects including race, imprisonment, deportation, and the death of a parent. The ARTT Room (short for "A Room to Talk"), is a place where 6 students in a special learning class get to meet every Friday unsupervised for an hour. They are allowed to talk about whatever is on their minds and throughout the course of the school year they share some of their deepest thoughts and fears. There was For a middle grade novel that is less than 200 pages, this story manages to cram in quite a few serious subjects including race, imprisonment, deportation, and the death of a parent. The ARTT Room (short for "A Room to Talk"), is a place where 6 students in a special learning class get to meet every Friday unsupervised for an hour. They are allowed to talk about whatever is on their minds and throughout the course of the school year they share some of their deepest thoughts and fears. There was a little bit of a Breakfast Club type vibe going on in terms of a group of kids who by the end of their time together share this bond and really opened themselves up to one another. Some really touching moments in the book. Would definitely recommend if you are looking to support books with diversity that explore important and timely topics. Six kids. A room to talk. For a whole school year six kids go into a room where they are to talk to each other. Throughout the course of this book they reveal stories about their diverse backgrounds. Harbor me was great. I flew through this book, it is quite short but I loved every bit about it. This is the first book of Jacqueline Wood son's that I have read...I know right? She's such a great well-known author and I hope to read more from her in the future. Harbor me stood out to me specificall Six kids. A room to talk. Harbor me stood out to me specifically because of the diverse cast of characters and seeing the characters open up to each other throughout the meetings was so interesting and seeing these characters with different backgrounds connect with each other because of their stories was truly beautiful. While Harbor me was a short book, just shy of 200 pages, it included a lot about race, deportation, death and bullying. Each of these topics were well represented in realistic ways throughout this book. I didn't enjoy Harbor Me as much as I wanted to but I still really liked the story and all he characters. I wish it was a longer book and that we could have gone more into Holly's character and maybe explored a bit more. Nothing inappropriate but more of a ya interest level. Harbor me was a beautiful story about friendship that stole my heart. Thanks to a Kid Lit Exchange reviewer for sharing her free review copy from #NerdCampMI with us! There are some books that I label "teaching books" and this is most certainly one of them. Of course it's one I want kids to pick up on their own as well, but it's one I want read out loud to every 5th and 6th grade class in the US this school year. It's one that might seem so so familiar to many students, but it's also a story that may need a bit (or a lot) of adult-led discussion to truly get the m Thanks to a Kid Lit Exchange reviewer for sharing her free review copy from #NerdCampMI with us! There are some books that I label "teaching books" and this is most certainly one of them. Of course it's one I want kids to pick up on their own as well, but it's one I want read out loud to every 5th and 6th grade class in the US this school year. It's one that might seem so so familiar to many students, but it's also a story that may need a bit (or a lot) of adult-led discussion to truly get the messages across to students in areas not as familiar with the issues of parent incarceration, deportation, and city life. I'll be honest, this is true of my tiny rural school district in Wisconsin. Kids will (or should!) have lots of questions about the content, and it would be such a rich class discussion novel. Loved the poetry included and the kid-led discussions. An incredibly short/fast read. "The hardest part of telling a story is finding the beginning." Where do we start the dialogue in this country about acceptance and respect for others? It seems as if the collective has lost their minds. Each side is focused on rhetoric, everyone consumed by a war of "Us" versus "Them". We have forgotten that WE the people are the country that we are supposed to "indivisible" and what we are supposed to stand for is "justice and liberty for ALL". Harbor Me is Jacqueline Woodson's first middle grad "The hardest part of telling a story is finding the beginning." 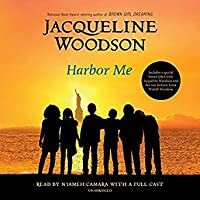 Harbor Me is Jacqueline Woodson's first middle grade novel since her moving autobiographical novel Brown Girl Dreaming which earned her the National Book Award for Young People's Literature and a nomination for the Newberry Medal. The protagonists are Esteban, Tiago, Holly, Amari, Ashton and Haley are six students assigned to a special education class. Their teacher understands the need for them to have their voices heard, to have someone understand where they are coming from. She creates a safe space for them to talk free from adult oversight. As their walls come down the group realizes that they can turn to each other in dealing with problems like bullying, racial profiling, deportation and parental incarceration. They gain comfort in being each other's harbor from the storm. Harbor Me is a wonderful book that serves as a testament of the power and beauty at the heart of the human spirit. A good book, whether it’s written for a nine-year-old, a nineteen-year-old, or a ninety-year-old can tilt your perspective, if only momentarily. Consider the concept of the “happy ending” and what it’s supposed to resemble. What does a real happy ending actually entail in real life? In children’s books, many times the ending of a given story is happy when day is done. In real life, something happy may happen to a child but where’s the “ending” in all that? As an author, Jacqueline Woodson doesn’ A good book, whether it’s written for a nine-year-old, a nineteen-year-old, or a ninety-year-old can tilt your perspective, if only momentarily. Consider the concept of the “happy ending” and what it’s supposed to resemble. What does a real happy ending actually entail in real life? In children’s books, many times the ending of a given story is happy when day is done. In real life, something happy may happen to a child but where’s the “ending” in all that? As an author, Jacqueline Woodson doesn’t eschew a sense of completion when you get to the end of her books. Kids could spend a long time debating whether some of her endings could be so simplified as to call them “happy” or not. Harbor Me falls into that category. The satisfaction a reader feels upon its completion is intrinsically tied to its writing, but to call this a “happy” book is to diminish it. Shooting for the moon, Ms. Woodson manages to fill this svelte title with a host of different ideas, lessons, and teachable moments. And while I don’t think it knocks it out of the park with every swing, it still manages to be one of the most interesting and well-written books of this or any other year. It sounds like a social experiment more than anything else. Six kids are removed from their classmates and placed in their own room for a weekly discussion. Their teacher’s rules are clear. “Every Friday . . . the six of you will leave my classroom at two p.m. and come into Room 501. You’ll sit in this circle and you’ll talk. When the bell rings at three, you’re free to go home.” Putting kids in a separate space together can end with either a “Breakfast Club” situation or a Lord of the Flies conundrum. Predictably, at first the kids don’t want to say a word, but when Haley starts bringing in a hand recorder, something cracks open. Esteban is able to talk about his dad, recently taken by the police and sent back to another country. Amari about the restrictions put on black boys in America. Ashton on being one of the few white kids in their Brooklyn school. But it’s Haley herself that has the hardest time talking. About her mom’s death. Her dad’s incarceration. As the room comes together and bonds, people listen to one another and everyone gets and ending. Happy or not. Now every children’s book that strives to imbue its pages with weight and meaning must contend with a danger that I like to call “the rogue cute”. The rogue cute is that moment where the author’s writing tips from meaningful into faux meaningful. From something that is honestly moving into something that feels like it’s trying too hard. All children’s books novelists contend with this issue to varying degrees of success. Ms. Woodson is no different, and there are times when she is more successful than others. For example, to read this book is to accept that it is, to a certain extent, an idealized situation. Six kids, mostly strangers to one another, are placed in a room where they may argue, disagree, or even tease but who are, in the end, devoid of cruelty. That’s the premise, but fortunately there’s a lot more going on here than just that. As with many children’s books, Ms. Woodson is conveying a message, but where she may seem to be painting with too broad a brush in some places, at other times she’s quite circumspect. For example, many novels for kids stress the need for us to empathize with one another. Woodson actually turns the concept of active listening into a whole book without hitting the reader over the head with the message. Each time a kid in the classroom wants to speak, everyone lets them, with a minimal amount of interruptions or interjections. Equity and diversity trainings often include a portion of the training where people are taught this very skill. Leave it Ms. Woodson to model this behavior for the next generation. As for the six characters, some are better delineated than others. I found myself thinking that single character points (being bullied, moving, etc.) are rarely proper stand-ins for personality traits. So I do wish just a smidgen more work had gone into showing precisely why this group has bonded as tightly as it has. I understand that much of it has to do with being able to talk honestly in a safe space. I guess I just wish there’d been 215 pages rather than 192, to allow for some more of those connections. That said, Ms. Woodson has somehow managed to write a handsome novel at less than 200 pages. If she stopped and thoroughly examined in depth every character to the same extent that she follows Haley, you’d be looking at a book that was at least twice the length of the one here. And while I wish I’d been able to know more than just one thing about some of these characters, I can’t help but admire the almost Hemingway-esque succinctness of the narrative. After a while, it got me to thinking about how we meet characters in books and how we meet them in real life. When you meet someone new, your brain essentially reduces that person to their most essential parts. This is in large part because we have to find a way to consolidate and organize the information about that person as quickly as possible. Authors, in turn, have to mimic that process on the page AND for a younger readership that’s been reliant on compartmentalization for years. It takes a certain amount of talent to accomplish this. Talent Ms. Woodson has in droves. When Ms. Woodson does delve deep into a character, the story ends up in some interesting places. Four of the kids in the room are described pretty darn well. Esteban is hard to separate from his own headspace, but I liked how you got glimpses of his life away from the page. “His nails were bitten so deep, there was a ring of pink skin at the top of his fingers. It looked painful.” Haley, meanwhile, was of interest to me because she highlighted something I’ve noticed in my own 7-year-old daughter. For children, memory can be shockingly short. I’ll read a book repeatedly for months when my kid is four only to find she has no memory of it at all at six. Haley is old enough to want more of her own forgotten memories. As she says at one point, “I’d lock every moment of memory inside a room in my brain and hope they’d multiply like cells in our bodies, until I was a grown-up all filled with memories. Maybe that’s what made us free. Maybe it was our memories. The stuff we survived, the good stuff and the bad stuff.” And it’s thoughts like this that push this book out of the ordinary into the distinguished. In some ways, the author is working a lot of themes into a single novel. She touches on everything from the Lenape, to the reasons why black boys have to get a talk from their dads about why they can’t play with Nerf or water guns in public anymore, to the death of a dog that manages to be heartbreaking in a shockingly short amount of time. Sometimes these elements land with the reader and sometimes they don’t but you cheer on the effort. Plus, you get a lot of really good lines along the way. Lines like, “I think this is what the world is – stories on top of stories, all the way back to the beginning of time.” This sentiment is echoed later when Haley remembers a moment when a familiar painting was taken off the wall, leaving a pale green square behind. This disturbs the girl immeasurably. “… I didn’t want to believe that was all there was. That when one thing went away, just the pale ghost of it remained. I wanted to believe in stories on top of stories. Always something else. Always one more ending.” Esteban’s dad’s poems are a clever inclusion too. Essentially, they enable Ms. Woodson to slip some poetry in there that would be too mature for the kids to be able to write, but that remains simple enough for them to parse themselves. A friend of mine mentioned to me recently that in some ways, Jacqueline Woodson’s two books for children out in 2018, Harbor Me and The Day You Begin contain similar themes. Of the two they preferred the picture book, and I do see why. For a lot of people Woodson manages an emotional resonance in those scant 32 pages that can be elusive in novels like this one. Harbor Me has strong emotional beats in the usual places, even as it doesn’t go for the jugular as often as I wanted, personally. For example, when it becomes clear that Esteban and his father are gone, I wanted more of a kick to my heart. Other choices didn’t appeal to me personally, like the fact that most of the book is a flashback from present day, right at the beginning. For the first fifteen pages I was confused and felt that the book had some difficulty finding its feet. Once it did, however, it continued forward cool and collected. That pretty much summarizes a lot of how I felt about the book. I didn’t always agree with the author’s choices, but I couldn’t argue with the results. At one point I wrote in my notes, “Oh, man. It’s good.” It is. I don’t think it’s perfect but perfection is kind of beside the point. I’ve only touched on a few of the myriad elements spotted throughout this book. Ripe for discussion, this is the book that will get kids thinking and talking and (maybe most importantly for some) listening for decades to come. Two years ago, this country elected a leader who promised to "Make America Great Again." But what does that mean? What is America, and what does it look like when it's great? In Harbor Me, Jacqueline Woodson offers her vision of America at its best. The plot is simple. Six tweens meet weekly to discuss their issues. Many issues emerge, with police shootings, loss of parents, and families separated by deportation getting the most coverage. The story breathes and moves naturally. The characters are Two years ago, this country elected a leader who promised to "Make America Great Again." But what does that mean? What is America, and what does it look like when it's great? In Harbor Me, Jacqueline Woodson offers her vision of America at its best. The plot is simple. Six tweens meet weekly to discuss their issues. Many issues emerge, with police shootings, loss of parents, and families separated by deportation getting the most coverage. The story breathes and moves naturally. The characters are honestly describing their experiences and feelings, so it never feels preachy. In spite of a plot in which practically nothing happens, Woodson crafts a suspenseful page-turner. I couldn't put it down because I was dying to know how the characters would develop next. Some of Woodson's books, such as Feathers, suffer from being about too many things at once. Not here. This book is honestly, heart-rendingly focused on the simple questions every teen must ask: "What does it mean to live in America today? Am I free? Am I safe? How do I relate to the people around me?" The characters struggle to answer these questions in ways that are vulnerable and honest. It might have been better if Woodson had kept her original title, The Dream of America; I wonder why she changed it. You know how, in the middle of the yard, there's that huge flagpole? Ashton said. And up at the very top, there's the flag? ...On the first day I got here, I stared up at that flag thinking, this is happening all over America. All over America, kids were walking into school yards and classrooms, and the American flag was waving. All over America, kids were saying the Pledge of Allegiance, saying 'indivisible, with liberty and justice for all.' All over America, we had memorized this, but did anybody know what it meant? * The first chapter is a little too artsy and off-putting. The second chapter would have been a stronger beginning. * I work with sixth graders with learning disabilities, and none of them are as articulate as the characters in this book. For that matter, I am less articulate than the characters in this book. However, this is not really a problem. These characters talk the way my students wish they could talk, and put into words the things my students wish they could say. My students will definitely connect with this book. Newbery Comment Regardless of whether this book wins a Newbery, it will be a huge hit. It will be read, loved, and discussed all over America this school year, and for as long as it is relevant. So needed for this country, our classrooms, our children, all our citizens RIGHT NOW. So powerful...the power of talk, of getting to know others ("Others"). So honest about race and privilege and ability (dis- and otherwise) and family and grief and loss and prison and immigration. It's all there, but it's not too much. Because it really is all there, all the time. And then I listened to the audio and fell in love again. Especially after listening to Jacqueline W Amazing book. I'm having a hard time with this. The writing is so lovely and the children are dear and genuine. But I wanted a different book, which may not be fair. This is mainly a collection of monologues told with eloquence. The reader gets the stories, the friends share, at a distance. I can't help but wish they were shown in real time, allowing the reader a stronger connection. In the end I felt like this was more a book to teach about 'important' issues rather than strong story-telling. I did have the I'm having a hard time with this. The writing is so lovely and the children are dear and genuine. Stunning middle grade novel tells the tale of six students who bond over stories of their young lives. 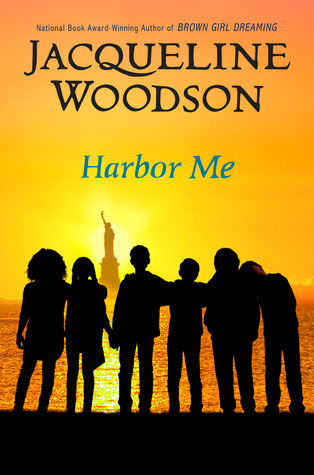 Woodson's writing combines beauty and ease, making Harbor Me an easy, artfully written book. I read this with hope, seeing the future of our beautiful country through the eyes of these six, enlightened children. Gorgeous, simple yet complex stories sure to capture your heart. Harbor Me is on the right side of history. I absolutely love the idea of being a safe harbor for someone. As a librarian, I believe that libraries are safe harbors. The students in this story battled their own perception of themselves and each other to create a unique safe harbor. Each character had such rich complexity! I absolutely loved the story line. This beautifully written book gives me hope for our future, where young people who can learn to get along are our real-life superheroes. When group of young Brooklyn students are given the opportunity to gather together in a safe, adult free classroom, they begin an explorative journey through dialog, poetry, revelation, and storytelling. Jacqueline Woodson taps into the most current challenges that many our youth face today with such unbridled courage and sheer eloquence. I did not ask to cry today but here we are. Harbor Me is so beautifully written that if it receives all the 2018-2019 children's literature accolades I'm assuming it will receive, I will have no qualms about it. Its message is a strong and relevant one, being dished out by one of children's literature's best authors. 1) I never had a clear understanding of why these six students were chosen for this "circle." This was important to me as a reader because I Harbor Me is so beautifully written that if it receives all the 2018-2019 children's literature accolades I'm assuming it will receive, I will have no qualms about it. Its message is a strong and relevant one, being dished out by one of children's literature's best authors. 1) I never had a clear understanding of why these six students were chosen for this "circle." This was important to me as a reader because I am an educator and this situation felt very impractical. Woodson's son even asks her this in the Q&A that followed the audio I listened to but he assumes (incorrectly, I think) that these six students are special education students and Woodson calls him on that, then reiterates something to the effect of "We can all learn from each other." So the initial question (my same question) was either lost or avoided. 2) This was firmly Haley's story and for the Breakfast Club-like plot to work, in my opinion, all the characters needed to be strong. Outside the poetic monologue each of the other students is given, they aren't very deep. Some have a little more depth than others, Amari and Esteban for instance, but Tiago, Holly, and especially Ashton are barely there. And speaking of Ashton, I found it interesting that Woodson's intelligent, thoughtful, inclusive son (in the Q&A), strongly disliked the character of Ashton. Woodson is one of the best (maybe the best) writers of fiction for young people. She's definitely one of my favorite authors. But I struggled to get into this book. Beautifully written, yes. Important topics and themes, yes. But it felt like a book written primarily to teach lessons, not tell a story. Most of this book consists of a group of fifth graders sitting in a room talking. Narrator Haley is sitting in her room reflecting on the past year. Sometimes we are with her as a twelve-year-old l Woodson is one of the best (maybe the best) writers of fiction for young people. She's definitely one of my favorite authors. But I struggled to get into this book. Beautifully written, yes. Important topics and themes, yes. But it felt like a book written primarily to teach lessons, not tell a story. Most of this book consists of a group of fifth graders sitting in a room talking. Narrator Haley is sitting in her room reflecting on the past year. Sometimes we are with her as a twelve-year-old looking back, and sometimes we are with her as an eleven-year-old living through the school year. She has recorded a lot of the dialogue in the ARTT (A Room To Talk) and is playing it back, but she also recounts a lot of dialogue that wasn't recorded. We also flashback sometimes to things that happened to her outside of school. All this moving around in time was confusing for me, especially because I wasn't able to read this in one sitting. We all need people to harbor us sometimes, when bad things happen or tragedy strikes or the world just becomes hard and lonely. In Harbor Me, six very different kids are brought together by a loving teacher to do just that. Every Friday afternoon, they gather in the old art room for an hour just to talk about whatever's on their mind. For Esteban that's his dad who was taken by immigration and is now being held far away from his family. For Amari that's the talk that his mom gave him about not p We all need people to harbor us sometimes, when bad things happen or tragedy strikes or the world just becomes hard and lonely. In Harbor Me, six very different kids are brought together by a loving teacher to do just that. Every Friday afternoon, they gather in the old art room for an hour just to talk about whatever's on their mind. For Esteban that's his dad who was taken by immigration and is now being held far away from his family. For Amari that's the talk that his mom gave him about not playing with water guns at the park anymore. And for Haley it's something that she's not quite ready to talk about yet - something no one at school knows. Jacqueline Woodson writes with such deep respect for her child audience and this is a moving and needed book in these turbulent political times. Things happening in the world affect kids, too, and they don't always have the space or language to talk about it. Woodson's given her characters that space and the resulting conversations are amazing. 1. This audiobook is full cast, and it's exceptional. 2. Harbor Me manages to be about a huge number of the major issues of the day, including immigration, imprisonment, racism, and much more, without feeling too heavy or too preachy. The characters feel so real, and it really highlights the importance of having a safe space to be able to establish open communication and build true understanding. 3. This book made me cry. There are so many heavy topics covered in this novel such as immigration, racism, privilege, and parental loss. I was mesmerized by the characters and I can't get over how brilliant this story is. Haley's use of the recorder to remember her friends confessions was perfect. I love how Woodson weaved the stories so beautifully making every situation relevant to our society today. Finally read/listened to Harbor Me. Gosh. All the feels & I might have been a little teary. Audio is exquisite with all the parts read by different kids & Jackie. So many important discussions can be kicked off by reading this book. For kids (gr 4+), teachers, adults, etc. I listened to the audiobook and it was extra special ... Jacqueline Woodson read Ms Laverne and her some reads one of the child characters... and they do the sweetest interview at the end. This is an important book for all to read ... and I wish felt as safe as these kiddos do in the ARTT room. Thank you Ms. Woodson for creating some amazing characters- so real that they leap off the page. Thank you for the message you gave them to carry, "What I will say is harbor each other. Even strangers. Every day." Thank you for making them friends so that they can teach us about the power of friendship. "I didn't know it would be people you barely knew becoming friends that harbored you." Thanks for writing a story for students who are not the same as others. "We had all been in the big c Thank you Ms. Woodson for creating some amazing characters- so real that they leap off the page. Thanks for writing a story for students who are not the same as others. "We had all been in the big classrooms before, and our learning felt like a race we were losing while the other kids sped ahead. We made believe we didn't care that we learned differently, but we knew we did." Thanks for showing us resiliency and hope. "We still all believed in happy endings. None of knew yet how many endings and beginnings one story could have." Thank you for writing a novel that I will read to my sixth graders that will teach them about wonderfully written prose, but also a lesson about caring for others (those who are different as well as those who are similar) in the current world climate. This will be my best book of 2018! or the things he does not yet understand. Esteban stood at the front of the room, staring at the page. Then he lifted his head and looked at us. We cheered again, even louder this time. I don't know if any of us really understood his dad's poem. But for a long time after he'd finished reading, I thought about that army of ants, how they were coming together.